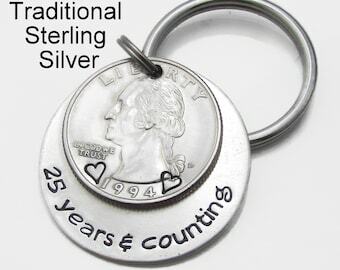 Announcement Hand Stamped Personalized Jewelry - Personalized Necklaces, Custom Name Jewelry, Personalized Bracelets, Personalized Keychains, Personalized Tie Clips, Wedding Jewelry and Gifts, Graduations Gifts, Personalized Christmas Ornaments and more - Custom and Personalized to your needs and specifications. Pieces are made with Sterling Silver, Gold Filled, Aluminum, Pewter, Stainless Steel, Copper and Brass. Special orders welcome. 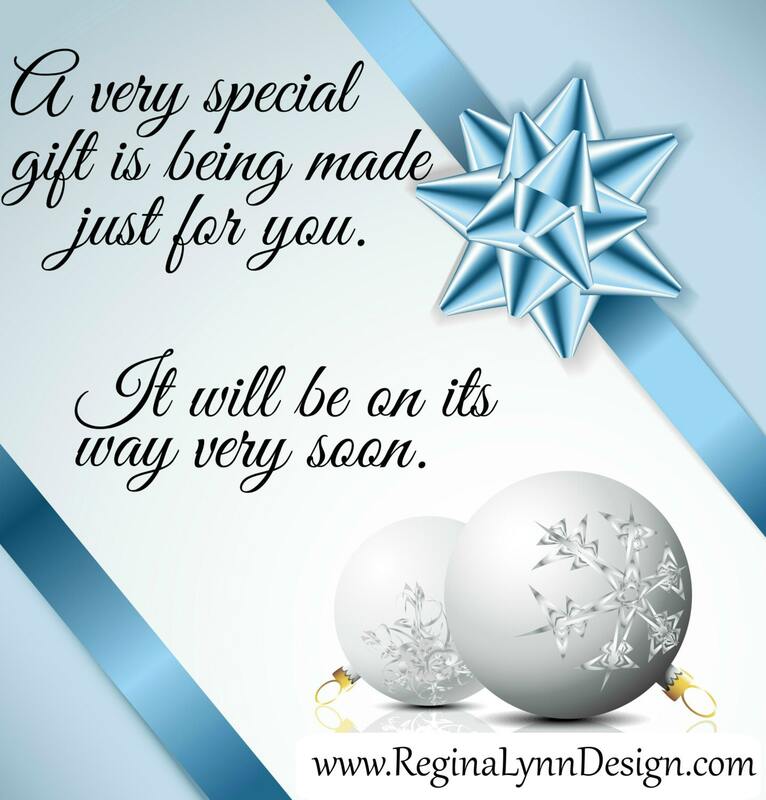 Thanks so much for making Regina Lynn Design such a success! I do value each and every one of my customers. I am a one-woman show, so do all of the creating, answering questions, shipping, etc. I am a busy shop so please bear with me as I try to juggle it all, including being a single parent of 3. Conversations will be answered as fast as I can but can take 24-48+ hours for me to get to them. Please use the Etsy CONVERSATION SYSTEM to contact me and not personal email as I do not check my email for customer questions (and they go into the spam folder and get lost). Also it keeps all communication in one place and details do not get lost that way. My current production time is 1 to 3 business days BEFORE it is placed in the mail. This does not include delivery time. Please feel free to contact me if you have any questions or I can help in anyway. I do have printable cards for a few occasions available while your order is being made. If you need a different occasion then I have here, please let me know. I am unable to control postal delays, so please plan ahead as refunds will not be given for shipping delays. Formally known as Fired Up Ladies Hammered. The same great products, designs, and service just a new name! 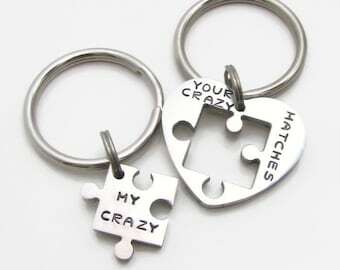 Hand Stamped Personalized Jewelry - Personalized Necklaces, Custom Name Jewelry, Personalized Bracelets, Personalized Keychains, Personalized Tie Clips, Wedding Jewelry and Gifts, Graduations Gifts, Personalized Christmas Ornaments and more - Custom and Personalized to your needs and specifications. Pieces are made with Sterling Silver, Gold Filled, Aluminum, Pewter, Stainless Steel, Copper and Brass. Special orders welcome. Item was received rather quickly. 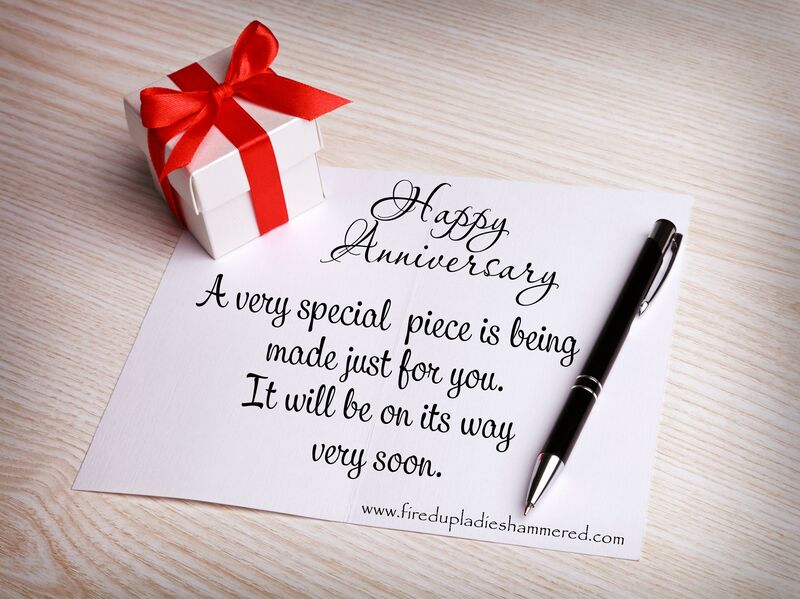 It was an anniversary gift for my husband & he loved it. Love it! My sister will love it too. Description was correct. Great communication. Fast delivery. Thank you! Class of 2018 grad gift idea. Perfect for all of your graduating seniors! 2018 pennies have arrived and are now available!!! 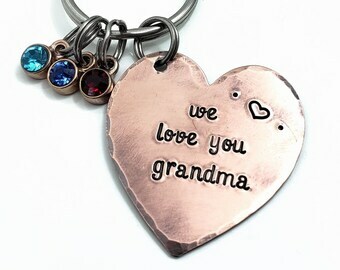 Regina Lynn Design - Personalized Jewelry, Ornaments, Keychains are all hand stamped one letter at a time. Each piece is individually handmade in my home studio in Indiana. 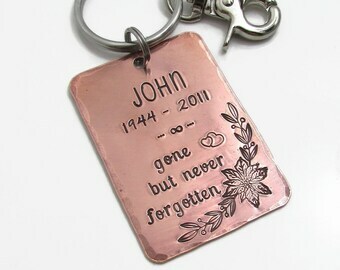 Each letter is an individual metal stamp that is hammered into the metal one strike at a time. There are no machines involved and everything is freehand. I start with an idea in my head and work through every design myself. Add in some hammers, stamps, a little vision, lots of love and care, hard work and that is how they come to life. Creating unique custom designs is a passion of mine also, so feel free to contact me. I will work with you to make your vision a reality. About me - I am a single parent of 3. All 3 in college at the moment. They have grown up so fast! As they are spreading their wings and becoming adults themselves, I hold them close by wearing jewelry inspired by and with their names. I have always loved having my name on things and remember as a 6 year old girl saving my allowance to have a name bracelet engraved. It was my very first piece of jewelry that I bought with my own money. But certainly not the last! 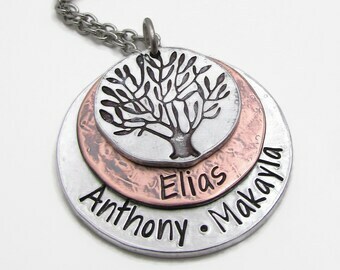 Through the years I have had many rings, necklaces, and bracelets with my name on them, most have been artisan made. Now that I have children of my own it was only natural to want their names also. I am so blessed to be able to create treasures that are of such a personal nature. To have a piece that I have made find a home and be so loved. I am a self taught artist. I hand make and design each piece one letter at a time. The letters are done with specially made metal stamps. They are individual letters that I hammer in one at a time to create unique and custom pieces. All items are custom made to your specifications after the order is placed, even if it is just as pictured. It is my hope that you are satisfied with every item that you purchase from my shop. As each piece is hand-stamped one letter at a time, the letters will not be perfectly "in-line" or centered. This is not to be considered a defect, but rather part of the charm and uniqueness of your piece. My current production time is 1 to 3 business days before mailing. All details are outlined in the item details of each listing. In the details you will find measurements, materials of each component, and all other pertinent information. The item details are in a tab, if you are on mobile, that needs to be clicked to open. Should an error in spelling be made that differs from the information provided at the time of purchase, I will remake the piece as needed. I will need the item(s) returned to me to be corrected. Besides an error in spelling on my end I cannot accept returns as this is a PERSONALIZED item with your chosen words. Besides a spelling error, all sales are final. Cancellations need to be made within 12 hours of the order being placed or before the piece has been started on, whichever comes first. Once the order has been started cancellations are not possible & the order will be shipped as scheduled. International Customers - Customs fees/duty taxes/VAT (Value Added Tax) are the buyer's responsibility and are paid by you to your customs department. I have no way of collecting this tax or have anything to do with this tax, as it is solely based on your Country and Customs. I mark all my packages as merchandise and put the invoiced value on them. Refunds will not be given if packages are not called for or refused because of import taxes being levied. How will my package be shipped & what is the delivery time frame? All shipping is done through the USPS and is first class. Once in the mail you will receive an email that your package is on its way and a tracking number attached. That way you will be able to know when to expect it to arrive. Delivery time frames - US packages are normally 2-5 days for delivery but can be up to 10 business days. International packages normally are 2-3 weeks for delivery but can be up to 5-6 weeks depending on customs in your country. (These are estimated time frames and are not guaranteed in anyway.) If you need to have your item faster please let me know as Priority & Express shipping are both available. All mailing is done in a bubble envelope for safe arrival. Oops, I gave the wrong address! If purchased through Etsy's direct checkout with a credit card please message me through Etsy's conversation system with the revised address. I will make a note on the order and confirm I have received it. If purchased through Paypal, I have to ship to the address entered at the time of purchase. No address changes are possible. The order will need to be repurchased with the corrected address in the ship to information. Can I request a custom piece be made? 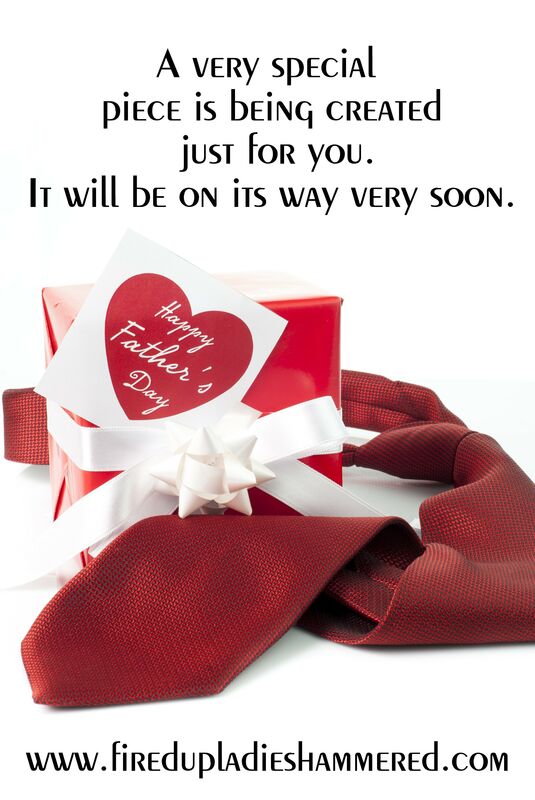 If gift wrap is purchased, all items in that order will be wrapped in tissue and placed in the one bag. If you would like multiple items individually wrapped, please purchase each one in a separate order, as the $4.00 charge is 1 item or all items in the order to go in the one wrapping. Gift wrapping includes the piece being wrapped in tissue, placed in an organza bag, and accented by a ribbon bow and gift tag. A gift message can be added to the tag, as shown in the picture.